Use a professional invoice service. This is a pretty easy step, it’s just a matter of picking which service is the best fit for you. I recommend Quickbooks, Honeybook or PayPal. A professional service will notify your clients their invoice is available, have a clearly stated due date, provide your accepted methods of payment, and list your terms and conditions. Determine your terms and conditions and stick to them. 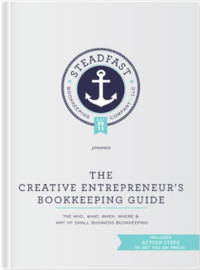 This will be slightly more challenging and you may need a small business attorney’s input (Christina Scalera is an awesome Attorney for Creatives). For creatives, your terms and conditions should ensure that you are being compensated fairly and timely for your goods or services, that your liability is limited, and that it is apparent who owns the content you create (if you are a designer, writer, photographer, or any other content creator, this step is very important). Once established, treat your terms and conditions as non-negotiable. Make sure your invoices include your contact information and your logo if possible. This is just another opportunity to brand your client’s experience. If you are billing your client for a service, make sure the invoice makes it obvious if the balance being billed is the total or a portion of their costs with you. The invoice should state if the charge is a deposit, or for a project being paid in full. If you use a professional invoicing service, you will have the opportunity to remind clients if their payments are overdue. It is still a good idea to set your own reminders to make sure nothing slips through the cracks. Once an invoice is paid, you want to ensure the payment is applied to the correct invoice. All 3 invoicing softwares mentioned above will do this automatically for you and this is also double checked each month when your bookkeeper reconciles the books. Lastly, don’t forget to thank your clients when they pay your invoices. They may receive an automated email from your invoicing service, but a personal email is more thoughtful and will show that you really appreciate their consideration and business. For bonus points or important contracts: mail a physical thank you note on nice stationery. Have you ever had an issue invoicing your clients? How was it solved, or if it’s outstanding, how can I help you sort it out?